Having read the first of this little collection as a separate novella (see here), I was able to dive in at no. 2. The first (Bad Spirits) sees Kate running away from a ruthless ex-boyfriend. He’s particularly keen to find her because she happens to have rather a lot of his money. In Dead of Winter, Kate sincerely hopes that the depths of a cold and unforgiving little town in Alaska will keep her well hidden, but when she witnesses a murder, she fears she’s been discovered. Hunky officer Sam is assigned to protect her…read exactly what you need into ‘hunky’! Unfortunately, to keep HIM safe, Kate has to flee Alaska to quite a different climate: Hawaii. Death Rites sees her reunited with old friends, who she hopes will keep her safe. But Hawaiian spirits have other ideas, it seems. 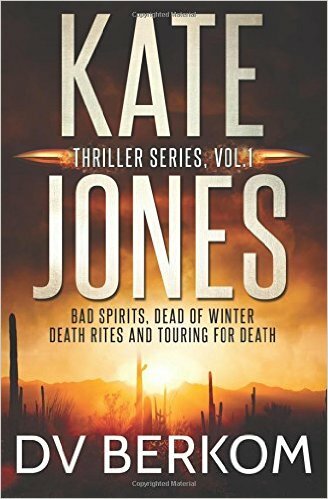 She shakes them off by surrounding herself with the Arizona desert in Touring for Death, where she manages to keep herself undetected for five years. But when you’ve had an entourage of drugs, money and guns, life eventually gets complicated and she’s fighting for survival yet again. Four novellas, by the end of which you’re gasping for breath! For heaven’s sake, Kate, go and work in a library, your life isn’t good for my constitution. I’m a huge, huge fan of Berkom’s writing and especially her hard-nosed, determined, no-nonsense heroines who still have a core of passion, sensitivity and judging by the men they chose, good taste! A roller-coaster read and I can’t wait to helter-skelter into books 5 and 6.